OpenBeam is available on makerbeam.eu! OpenBeam stock arrived at the MakerBeam warehouse, all items have been added to the makerbeam website, pricing is in place …… we are ready to sell OpenBeam! OpenBeamUSA and MakerBeam.eu joined forces. 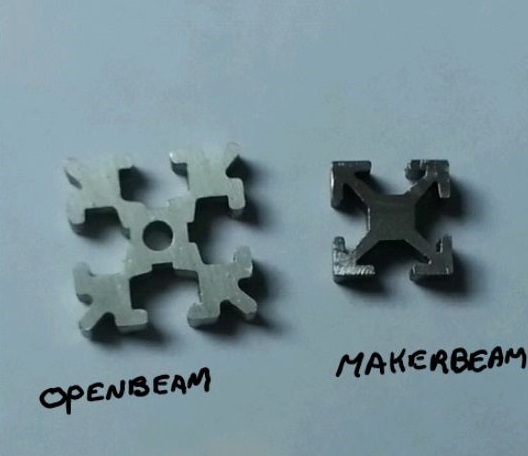 We are happy to tell MakerBeam.eu is now lead importer of OpenBeam in Europe! From today on OpenBeam can be ordered in our webshop www. makerbeam.eu. black and clear anodised. Lengths in kit in mm: 300, 270, 210, 150, 120, 90, 60, 45, 30. In the kit we also sell L-brackets, T-brackets, OB feet, hexagon head screws, button head socket screws, hex nut driver, hex key driver and nuts. – Precut extrusions, black and clear anodised in different lengths in mm: 1000, 300, 270, 210, 150, 120, 90, 60, 45, 30. Only the 1000mm length beams we sell as a single item. All other lenghts are sold in packs of 4. – Precut extrusions for Mendel, black anodised (in mm: 390, 300, 450, 240). 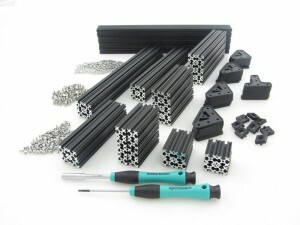 – Precut extrusions for MiniKossel, black anodised (in mm: 600, 240). Soon we will have Kossel en Mendel kits available as well. Both MakerBeam and OpenBeam are anodised aluminum extrusions with a diameter of under 20mm available in black or clear. Great for desktop projects. OpenBeam does not need special screws which is an advantage. The screws are a bit small in comparision to the size of the profile though. The surface area of the cross-section of OpenBeam is more than double this surface area of MakerBeam. Size makes OpenBeam more suited for bigger projects and MakerBeam for smaller projects. The stainless brackets of MakerBeam seem to be more robust than the plastic ones of OpenBeam at first glance. The OpenBeam brackets are injection molded out of EMS Grivory GVX, a high-performance, high glass fiber reinforced polyamide copolymer that is engineered for metal replacement applications. Why choose the one over the other? Your choice will depend on personal preferences and on what you plan to build. What do you think your project needs? The two profiles are different, but comparable and in the near future there will be more and more compatible products. For now enjoy our new product range. We as a team are looking forward to see what projects you make with OpenBeam, MakerBeam or a combination of both! Posted on 2013/08/30 2016/09/22 Categories UncategorizedTags 1515, 15x15mmLeave a comment on OpenBeam is available on makerbeam.eu!